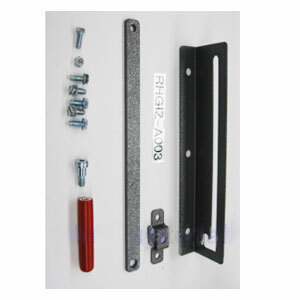 PRODUCT: Roof hatch replacement hold-open arm and bracket kit. Includes upper/lower brackets and hold-open handle. Arm is about 14.25" Long. Price/Kit. DESCRIPTION: Constructed of heavy gauge steel brackets with a red color hold-open handle and mounting hardware. Bracket: 13-3/4 x 3 x 1-1/2, .100 steel, with three 1/2" holes. Handle: 4x .85 OD with red vinyl dip coating. Hardware: 5/16 x .725 hex head screws, Type B tapping point. Weight: Assembly weighs about 3.05 lbs with hardware.